Another valuable WWII-inspired entry in the Criterion Collection. Writer-director Louis Malle's childhood informs Au revoir les enfants, a story about two boys at a Catholic boarding school in occupied France during the winter of 1943. The film presents the period through the point of view of children but that doesn't lessen the story's power as viewers know from history what was unfolding outside the school's walls. Julian Quentin (Gaspard Manesse), when we first see him at the train station, doesn't want to leave his mother's side and return to school from the holiday break, but once there he acts like a tough guy to establish himself with the other boys. Jean Bonnet (Raphaël Fejtö) is one of three new students to the school. He looks and behaves differently from the rest of the children. He's smarter at math and accomplished on the piano. His differences make it easy for the others to pick on him, a universal suffering for many a kid new to a school or neighborhood. One night, Julian discovers Jean might not be Catholic like the rest of the students, but he keeps it to himself because he has his own nighttime secrets with his occasional bed-wettings. They bond through their similarities. Both boys enjoy reading books, and each has to deal with absent fathers. Julian's is always working in a factory; Jean doesn't know the whereabouts of his, presuming the worst. Nazi soldiers perform routine searches of the school and their presence outside the school is constantly shown, hinting at the story's inevitable outcome. 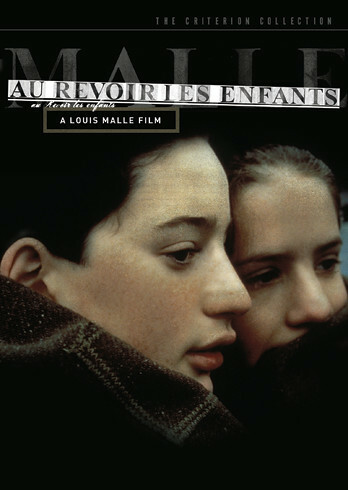 Yet Au revoir les enfants does such a fine job drawing the viewer into the perspective of the children's lives, thanks to Malle's skill as a filmmaker and his talented lead actors, that it creates oases where the inhumanity taking place at that time can be briefly forgotten. The video has been given a 1080p/MPEG-4 AVC encoded transfer displayed at an aspect ratio of 1.66:1. The color palette uses a lot of dull earth tones and they look accurately rendered. The image shows very good detail on display in the fabrics of the blankets and clothing and the textures of the weathered buildings and the worn wood of the desks. There is good dimensionality and shadow delineation. Film grain is evident throughout. There are a number of dark scenes but only a slight bit of crush occur in the sequence when the boys head to shelter during air raid that disrupts their algebra lesson. The print looks clean though a hair does pop up in one scene. The liner notes reveal the French Mono soundtrack "was remastered at 24-bit from a 35 mm magnetic track" and it sounds clean and free of defect. The track offers great clarity in effects as water dribbling into a full tub and the pings of shower curtain rings can be heard clearly. It's a dialogue-driven film and the voices come through clear. The video for the Special Edition Features all are 1080i. Recorded for Criterion in 2005, "Pierre Billard" (31 min), French film critic and author of "Louis Malle: Le rebelle solitaire" discusses Malle's life and its influence on his work. In French, with optional English subtitles. Also recorded for Criterion in 2005, 10 years after her husband's death, "Candice Bergen" (1080i) discusses her husband and his work, including this film. There is video of Malle at work on set and receiving the Cesar Award. During "Joseph: A Character Study" (6 min), University of Paris Cinema Professor Guy Magen talks about the character and his role in the story as scenes and stills from the film play. In French, with optional English subtitles. During "Au revoir les enfants", "Charlie Chaplin's The Immigrant" (26 min), a 1917 two-reeler, plays for the children and staff. The Statue of Liberty is seen in Chaplin's short and it seems rather incongruous that the gift was given by ancestors of French men and women who were collaborating with the Nazis. "Louis Malle at AFI" (53 min) is an edited audio interview with the director held at the American Film Institute in Los Angeles on December 7, 1988. The Blu-ray also comes with a Teaser (1 min) and a Trailer (2 min), both in French with optional English subtitles, and a 22-page illustrated booklet featuring Philip Kemp's essay "Childhood's End" and Francis J. Murphy's "Pere Jacques and the Petit-College d'Avon." The events that inspired Au revoir les enfants obviously had a long-term and profound impact on Louis Malle considering he told this story over 40 years later. However, the distance of time doesn't diminish the impact of the film. It's another valuable entry in the Criterion Collection that examines WWII.